Spring has definitely sprung here in Austin and though blooms may be foremost for most garden lovers, foliage loveliness deserves a shout-out. 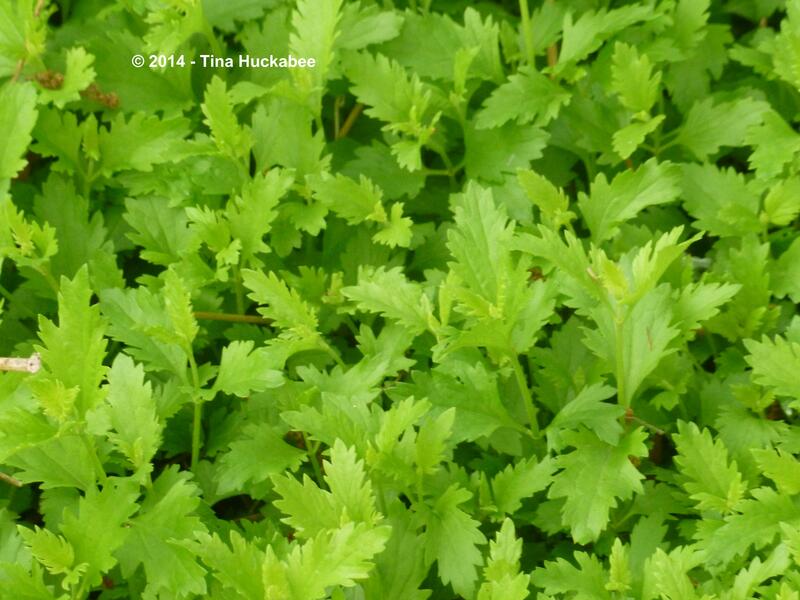 Here are my foliage favorites for April. The summer and fall blooming Gregg’s Mistflower (Conoclinium greggii) sports deeply lobed foliage, giving rise to one of the common names for this hardy ground cover, Palmleaf Mistflower. Yarrow (Achillea millefolium) has beautiful foliage year-round. 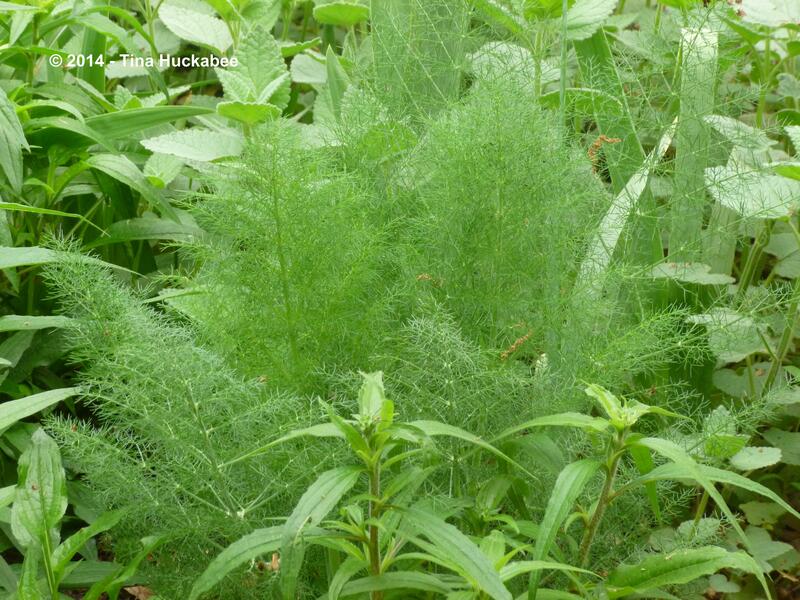 It’s delicate, fern-like and spreads well (sometimes too well). 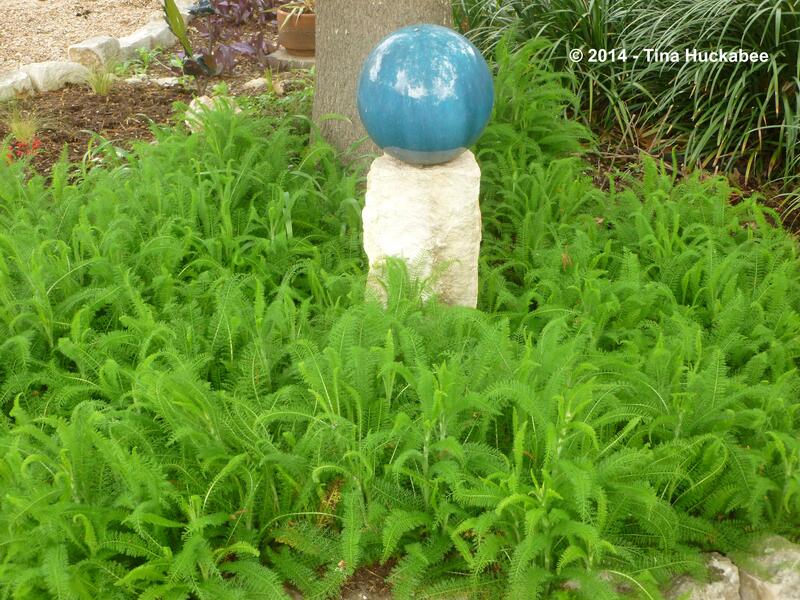 Yarrow is evergreen, hardy and drought tolerant. It brightens this shady spot. A perennial favorite of mine and one I’ve profiled before, Mexican Feathergrass (Nassella tenuisima) is at the zenith of beauty in the spring. The lone green Fennel (Foeniculum vulgare) in my back gardens apparently wasn’t decimated by butterfly larva last year. 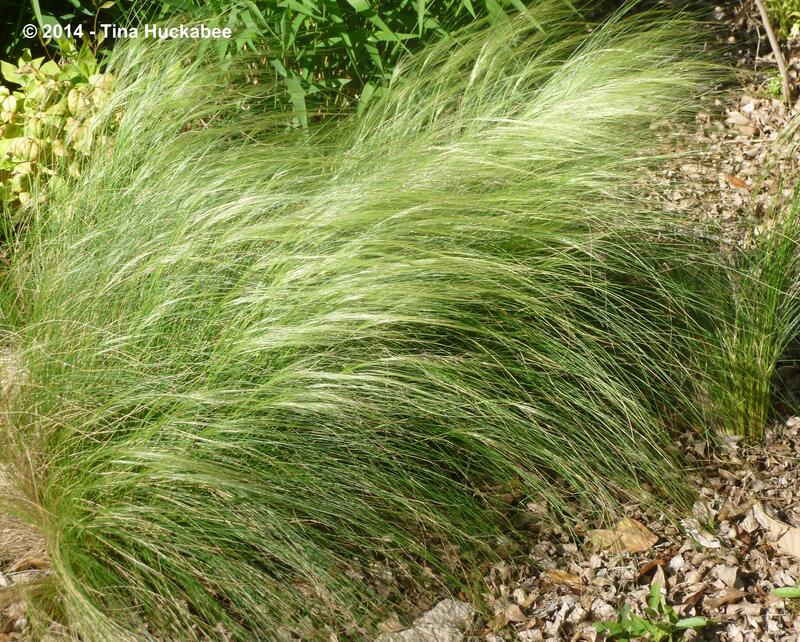 With soft, graceful foliage, it’s a wonderful addition to the mixed perennial garden. 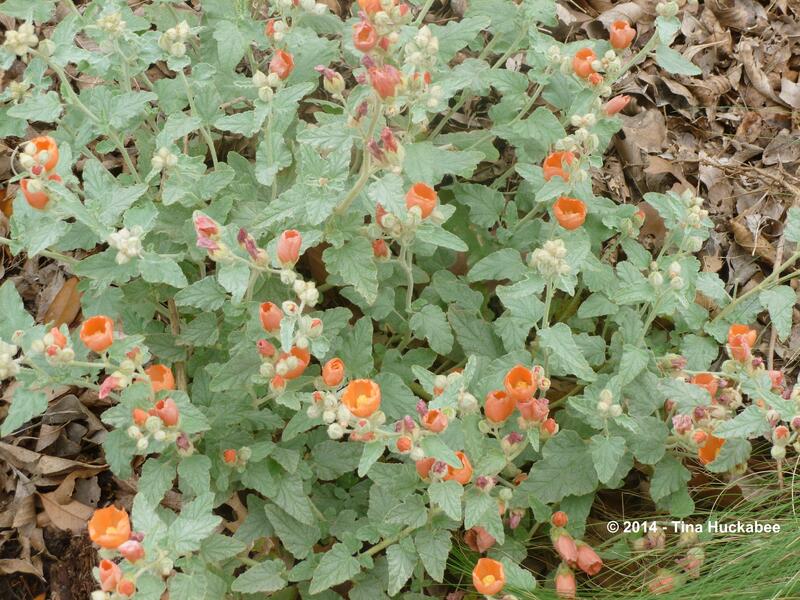 Globe Mallow (Spaeralcea ambigua) is such a show-stopper with its combination of orange blooms and arresting, pale gray-green, fuzzy leaves. I like this combination of Pale-leaf Yucca (Yucca pallida), Heartleaf Skullcap (Scutellaria ovata) and the bright green Autumn Sage (Salvia greggii). 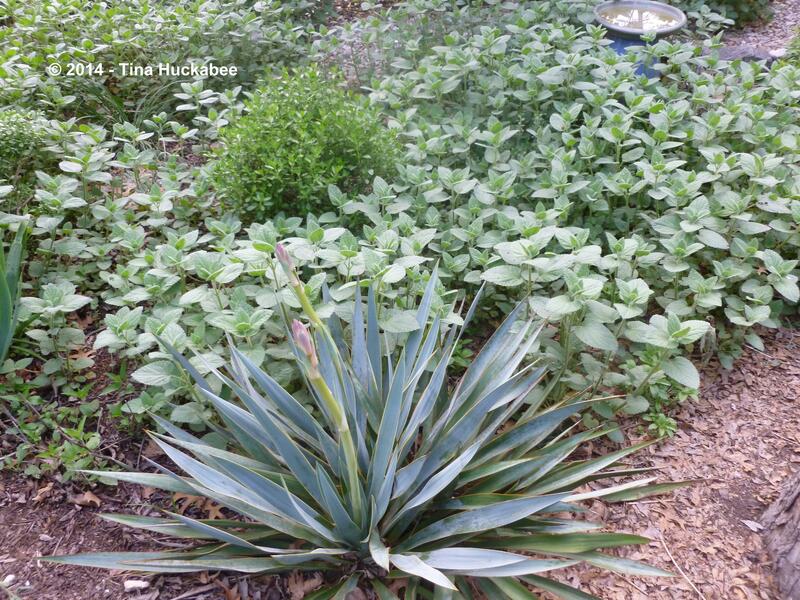 The Pale-leaf Yucca appears blue against the backdrop of the greener Skullcap ground cover and the Autumn Sage’s is a bright green punctuation situated further in that same ground cover. 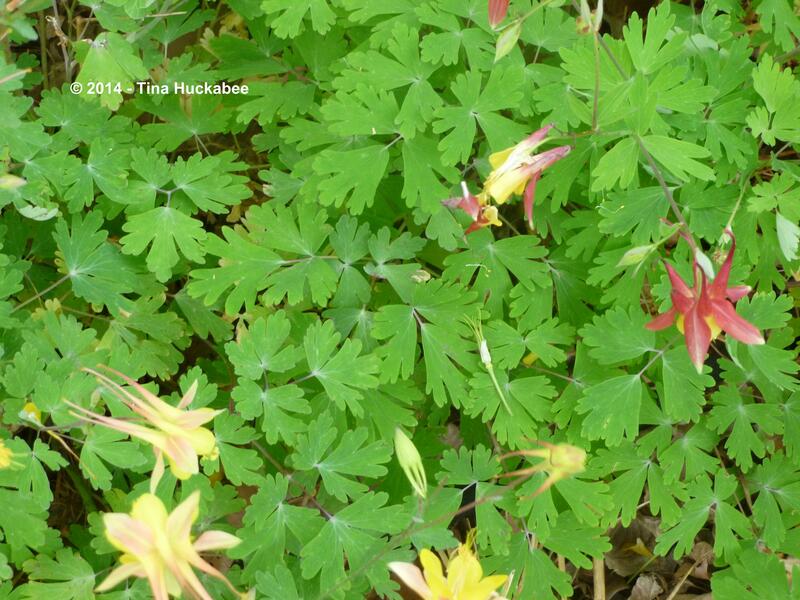 The Wild Red Columbine (Aquilegia canadensis) not only has beautiful blooms in spring, but interesting foliage year-round. New growth from a young American Smoke Tree (Cotinus obovatus), promises more beauty as it matures. Lastly, I can’t resist the photo of the Scarlet Tanager, Piranga olivacea, who has visited my garden this past week as he rests on the green branch of Retama (Parkinsonia aculeata). Plumage and foliage–you can’t beat that! Thanks to Pam at Digging for hosting Foliage Follow-up for April. This entry was posted in Achillea millefolium, American Smoke Tree, Aquilegia, Aquilegia canadensis, Autumn Sage, Columbine, Conoclinium, Conoclinium greggii, Foeniculum vulgare, Globe mallow, Green Fennel, Gregg's Mistflower, Heartleaf Skullcap, Mexican Feather Grass, Mistflower, Nassella tenuissima, Native Grass, Native Plants, Pale-leaf yucca, Parkinsonia aculeata, Retama, Salvia greggii, Scarlet Tanager, Sphaeralcea ambigua, Uncategorized, Wild Red Columbine, Xeric plants, Yarrow, Yucca pallida and tagged Achellia millefolium, American Smoke Tree, Aquilegia canadensis, Columbine, Conoclinium greggii, Cotinus obovatus, Globe Mallow, Gregg's Mistflower, Heartleaf Skullcap, Mexican Feathergrass, Nassella tenuisima, native Texas plants, Pale-leaf Yucca, Palmleaf Mistflower, Parkinsonia aculeata, Retama, Scarlet Tanager, Skutellaria ovata, Wild Red Columbine, Yarrow, Yucca pallida by Tina. Bookmark the permalink. Cool about the tanager — so lovely. I will be interested to hear updates about your smoke tree. I tried a purple one a number of years ago, but it didn’t seem to like our summers. Perhaps the green variety is tougher, or you have a better spot for it than I did. Hi Pam–I was thrilled to see that pretty boy. I haven’t seen him in a couple of days, but I hope he returns. I’ve wanted a Smoke Tree for a while–I’ve planted it in the garden with the sort-of-alive Barbados Cherry and I’m looking forward to seeing it bloom. I planted Aquilegia canadensis but it did not return for me, though garden varieties of Aquilegia flourish and self-sow all around. Yours looks lovely. 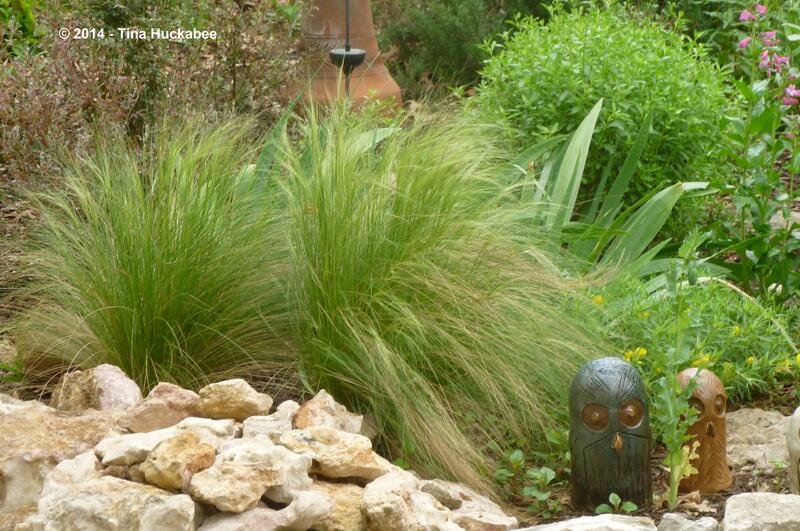 Your agave looks great with the Scutellaria too. I wanted to grow Sphaeralcea but didn’t get it to grow from seed, it’s fun to see your beautiful plant with blooms. Hi Hannah, thanks for visiting. Don’t be discouraged–if you like the columbine(s), try another. Sometimes, things happen and you may have better luck. I don’t think the Spaeralcea that is common from the nursery trade here in Austin tends to seed out–it’s actually not native to this area but to the states west of Texas. 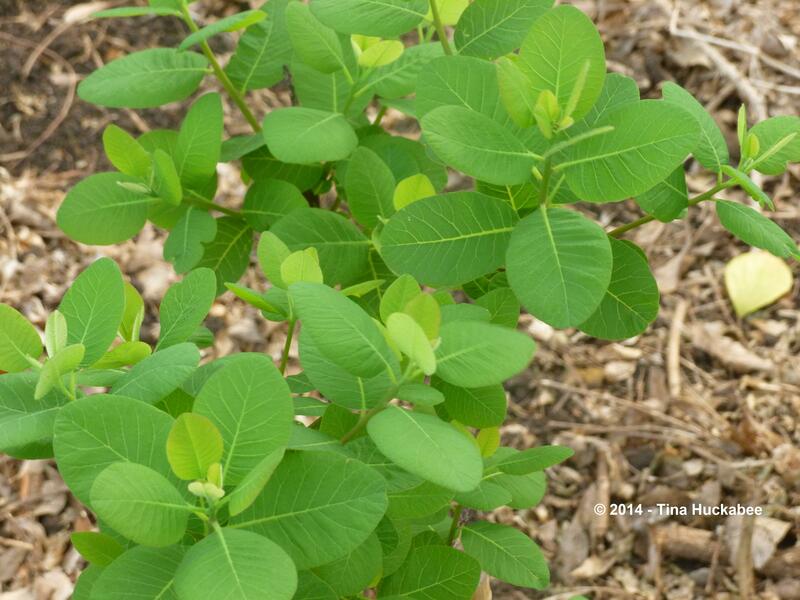 I’m not quite sure why the true Texas native isn’t commercially available and I bet it would seed out, too. Such lovely leaves – I’m eager to see how your smoke tree fares. I’ll second Hannah’s story of Columbine failure. I’ve tried it in beds out front and in back and had it flounder then disappear in both places. I’d like to hunt for the native form and start it from seed and see if that is the answer, though now I’m realizing I better check for deer resistance. I had yarrow that gave me the slip as well, but yours is so lovely now I’m determined to try it again too. 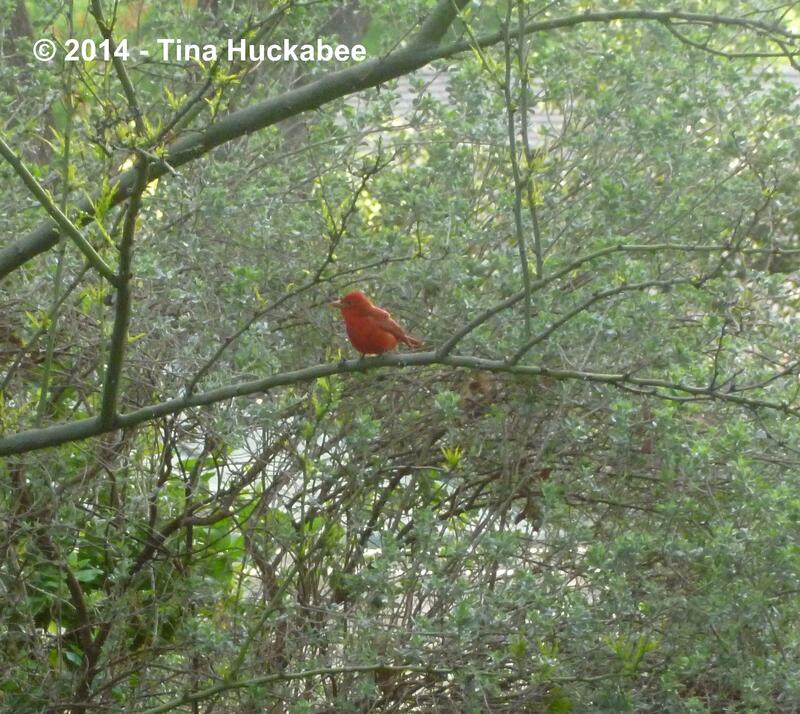 Finally, that tanager! What a sight! That tanager, right? I feel so fortunate that he visited–wish he’d come back, but I’m guessing he’s moved on. I think the columbines are mildly deer resistant–maybe that’s not enough for your situation and I’m not sure about the yarrow. Good luck with all of the above and I will keep tabs on the smoke tree.